After months of aggressive attacks by the Hungarian government, it's most likely that the three-decade history of the Academy as a free, autonomous public body and supervisor of Hungary’s largest scientific research infrastructure will be brought to an abrupt end. What is happening to this research centre network and why? The story began in June 2018, when the new Minister of Technology and Innovation, László Palkovics, proposed an apparently tiny, technical amendment to the budgetary laws in order to reallocate the annual financial support for the academic research center network from the Hungarian Academy of Sciences’s budget line to that of the new ministry. The real purpose of this motion was, however, unmistakably radical. Even though the minister denied that his proposal would put an autonomous institution under Government control, it obviously aimed to deprive the Academy of its privileged status as the custodian of the largest domestic research infrastructure while strengthening the position of the new minister and putting him in charge as the arbiter of policy-making on research, development, and innovation. The minister gave Academy’s president just 54 minutes to comment on the proposal sent to him via email. The bill passed in the Parliament in a matter of days. Ever since then the same thing has happened time and again: the minister has been unilaterally announcing new details of his plans, while the Academy has been searching for the possibility of some kind of modus vivendi. 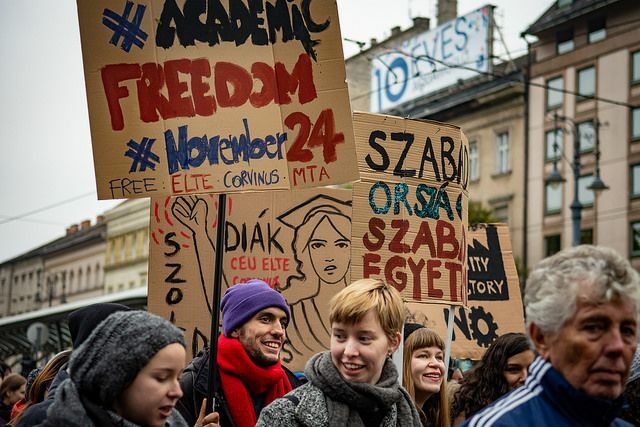 In recent months there have been some political protests against this newest attack on academic freedom, but nothing comparable to the case of the Central European University (CEU), while the Academy itself has remained self-restrained and tried to be open to principled compromises. The only exception to this pattern was the extraordinary meeting of the General Assembly of the Academy in December 2018, where an overwhelming majority of the representatives said “no” to the minister’s reform plans and expressed their support for the Academy’s president and presidium. The General Assembly demonstrated a level of unity and resolution that most probably surprised the minister and encouraged him to spend two months undermining it by minimizing communication with the Academy presidium, contacting the leadership of the individual research centers directly instead and launching the new financing system months in advance of the official deadline for bilateral negotiations between the Academy and the ministry. Before that, however, the minister decided to hold back most financial resources from the research centers, probably because he thought doing so would make the leadership of the Academy more open to his reform plans. The Hungarian Academy of Sciences has a complex structure. It was originally founded in 1823 in order to promote Hungarian-language scientific activity, and it was financially supported by private benefactors, most notably by Count István Széchenyi, a famous politician and social reformer who offered his entire income for a year (or more precisely, the interest on that income) to the new Academy. As a result, the Hungarian Academy of Sciences became a national symbol, an autonomous public body and a centre of Hungarian cultural life with an elegant, neo-Renaissance headquarters located at the heart of what was then the new metropolis of Budapest near the Lánchíd Bridge (Count Széchenyi’s other significant contribution to the development of his native country). After World War I, the Academy went through a deep economic crisis, but its autonomy was finally strengthened and successfully maintained until the end of World War II when, after the spurges of Academy members by the successive regimes (first the nationalist-conservative Horthy-regime, then the Nazis, then the short-lived democratic regime and finally the communist Rákosi-regime), the Academy became a typical Soviet-type institution and puppet of the communist state. Ironically, it was in the darkest years of the 1950s that an important new element was added to the Academy: the research institute network. It had certain domestic antecedents, but mostly it was adopted from the Soviet academic world (which borrowed it from the predecessor of the contemporary Max Planck Society). After the post-communist democratic transition, the Academy refrained from any political witch-hunts. The main objective of its presidents has been to retain the values embodied by its various academic institutions while adapting them to the challenges of the new millennium. The latest of these reform processes was initiated and executed by Academy president János Pálinkás, a former minister in the first Orbán cabinet who centralised and rationalised the smaller institutions into 15 research centers, introduced a new scientific performance evaluating system, and increased the role of tender-based financing, all while respecting the special demands of various disciplines from the natural to the social sciences to the humanities, from basic research to applied research. Until last year, the Hungarian Academy of Sciences united the characteristics of a 19th-century scientific society with a modern research institutional network. Academic freedom was guaranteed by the autonomy of the Academy, based on two pillars: on the one hand, the Academy was led by a self-governing body from the community of distinguished researchers performing an important role in managing the research centre network and supervising its work and, on the other hand, its financial background was stable for decades because its budget was negotiated on non-partisan grounds every year. The new financial system, therefore, will inevitably be seen as an almost unprecedented attack on the Academy’s autonomy and the principles of academic freedom. Although we are still in the phase of changing the academic research centers’ financial background, the main goal of the minister was made clear already in August 2018 when he presented his plans to the president of the Academy, showing him a slideshow declaring that the academic research institution network has to be radically restructured and divided into three parts: some elements have to be integrated into the universities, others will go into a new research institution network system under the auspices of the ministry, while a third part will formally belong to the Academy but also fall under the supervision of the ministry. The new system will be financed by two vast funds, a research fund and an innovation fund, while strategic questions will be decided by a Government agency and multilateral consultative body. The most striking feature of the proposed new system was its overly-centralised structure and its shocking expansion of direct or indirect governmental control over areas where academic autonomy hitherto prevented direct political intervention. The plan intended to abolish core funding and replace it exclusively with tender-based financing through thematic focuses to be determined by the Government. It was also designed to strengthen the position of the universities at the expense of the Academy’s research centre network. The plan was quite explicit about its “vision”: scientific research is only as valuable as its contribution to innovation and enhancing economic competitiveness, because Hungary’s main economic problem is its poor performance on innovation, and the weaknesses of universities and small and medium-sized enterprises are primarily responsible for that poor performance. Accordingly, the centralisation of research resources is seen by the minister as a necessary means to improve innovation. It is not the reader’s fault if she does not immediately understand this plan and asks instead why on earth centralisation, extensive political control and the abolition of the Academy’s research centre network is likely to enhance innovation in small and medium-sized enterprises, or why the humanities or the natural sciences should be restructured in favor of the economic competitiveness of small and medium-sized enterprises. There is a striking discrepancy between the minister’s plans and the diagnosis of the economic competitiveness and innovation problems that has been provided by his policy analysts. Spending the money of the taxpayers responsibly is one thing, but narrowing down scientific research to the demands of innovation is something completely different; and Mr. Palkovics’s plan intends to achieve the latter. Three possible explanations might come up as plausible responses to the question of why this discrepancy exists in the Government’s plans concerning the Academy. First, the minister personally prefers centralisation as a policy, and his vision of a centralised research, development and innovation infrastructure is more or less completely disconnected from the diagnosis his analysts provided him. Second, in the next seven-year budgetary period of the EU, innovation will be an area on which vast amounts of money will be spent, and centralisation could help the Government control the spending of this money. Third, there is a longer-term pattern in the policy-making of the Orbán regime in which centralisation and the expansion of political control are always the preferred choices. Arguably, this pattern is an important part of what many researchers see now as the de-democratisation process ongoing in Hungary and the emergence of an authoritarian regime here. Needless to say, academic freedom is never a cherished value of any authoritarian regime. What will happen next? The prospects for the friends of academic freedom and the employees of the research centres of the Academy are rather unfavourable, but the fight is not over yet. Proofreading by Gwendolyn Albert. This article was first published on cz.boell.org. It is part of our special "Focus on Hungary". On April 4th 2017, the Hungarian government passed amendments which are obviously directed against the renowned Central European University (CEU), founded by George Soros. In our feature, we collect articles on Orbán’s attack on academic freedom. Our dossier on Hungary is as a forum for critical voices since the right-wing government came to power in April 2010. The contributions reflect the socio-political changes as well as long-term developments.